The original is still the best! 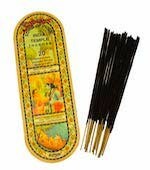 The #1 best selling incense in the world. 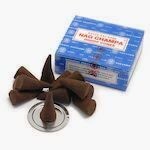 The most famous component of Nag Champa is the champa flower, from the Magnolia champaca tree. Prized in India for its bright yellow color and delicate fragrance, the tree is often planted near ashrams. Indian women have been known to tuck a champa blossom behind their ear, letting the scent escape as their body heat warms the petals. 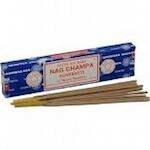 Nag Champa has a sweet, slightly woodsy smell that many people describe as calming and warming. For some, the smell is reminiscent of jasmine or magnolia flowers, the forest, or even tea. It is great for use during meditation and just relaxing in your home. One smell and you'll be hooked, too! OTHER SIZE BOXES ARE AVAILABLE IN OUR STORE!